We are pioneers in Vietnam: since 1994, we navigate leisurely on the country’s trails. 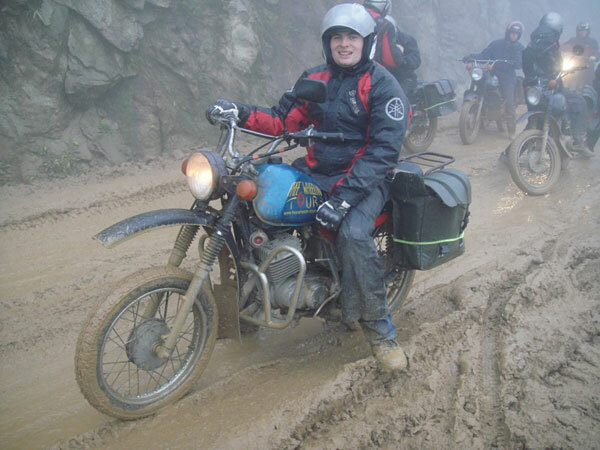 We have given preference to the Minsk 125cc, which, for us, is THE “hiking” bike par excellence. We have the latest Minsk models, brand-new, true collectors’ items, and the best mechanics to take great care of them. The Minsk is a brave bike, handles the road very well, and is easily repaired. With a Minsk 125cc, we travel in harmony with the country’s rhythm. More modern machines do not fit with the spirit and the risk of hurting a child increases. Therefore, we “stick” with the Minsk. However, for highly-experienced and responsible bikers, we sometimes organize tours on more modern…and more expensive machines. Our bikes are insured for Third Parties and equipped with two 40-liter horse bags to be autonomous. – Bath linen, torchlight, knife.All the above can be purchased in Hanoi at a cheap price, except the repellent.